Weather forecasting, monitoring and alerting are key priorities in our today world and especially in our mission critical activities. Weather monitoring watches global climatic data that weather sensitive organizations extend with local and real time analysis to adapt their processes to actual conditions and immediately react to local phenomenon that could have major impacts. Such weather monitoring systems require a network of sensors and communication equipment that must be highly reliable, performing and qualified for the climatic and electromagnetic operating conditions. Such small weather stations are used in large infrastructures such as airports to monitor real time conditions around landing runways. Pressure, hygrometry, temperature, wind speed and direction sensors are connected to ruggedized Ethernet switches in several points of the landing runways and data are transmitted in real time to the analysis and control center. Video cameras provide detailed views of these critical areas through the Ethernet network. 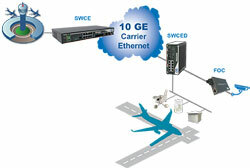 CXR Ethernet portfolio provides a global solution to such mission critical networks that are facing weather hazards. CXR ruggedized switches are qualified for severe electromagnetic environments and extended operating temperature ranges (-40 to +75 °C). Access switches deliver a POE power supply to feed video cameras or sensors. CXR aggregation and backbone switches bring best performances in any condition thanks to a 10 Gigabit Carrier Ethernet architecture with service aware hardware accelerators.